Incredibly addictive, challenging, and fascinating. Years ago known as the magic cube. This World-famous puzzle is a terrific way to promote themes like: solutions, puzzles, integration, innovation, engineering, excellence, thinking, logic, challenges and more! Order the stock cube with a different stock color per side and standard imprint on white side only. The Rubiks Cube is a fun puzzle.Put your brand at the center of the challenge with this Rubik's (R) 9-Panel full stock cube. And, since this product uses 100% pre-consumer plastic in these 90% plastic material cubes, you can capitalize on the popularity of the green trend all while offering recipients something nostalgic and fun. Take advantage of multiple etch areas for maximum brand exposure and enjoy a lifetime guarantee from a QCA certified supplier. Add a touch of fun to your advertising efforts today! Gift Box / 37 lbs / 120 pcs. / 16" x 14" x 10"box. 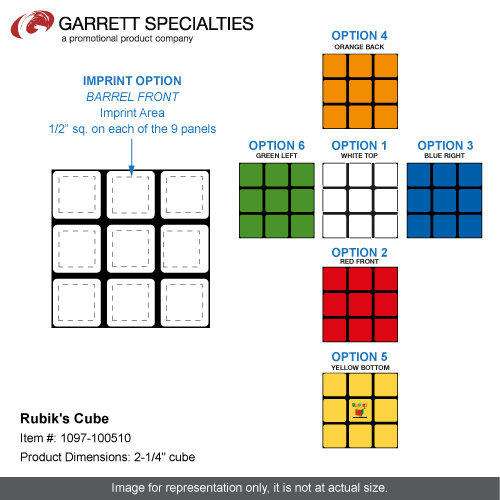 Note: Center square on the yellow panel is not available. 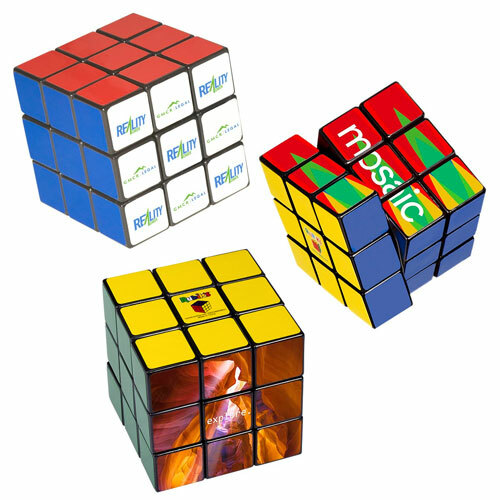 Licensing requires the Rubik's logo to be placed in that position.